Our passion for learning is our tool for survival. "If the sides of a polygon are restricted so that they pass through fixed points and all the vertices except one lie on fixed straight lines, the free vertex will describe a conic or a straight line." 1769 Benjamin Franklin observes a transit of Mercury at Norriton, Pennsylvania in the distinguished company of William Smith, D. D. Provost of the College of Philadelphia (later the Univ of Pennsylvania); John Lukens Esq; Surveyor General of Pennsylvania; David Rittenhouse (astronomer, inventor, clockmaker, mathematician, surveyor, scientific instrument craftsman and Friend of Jefferson), M. A. and Mr. Owen Biddle. Franklin, as President of the Philosophical Society at Philadelphia would communicate the results to the Royal Society in London. 1862 ? A clipping in Charles Dodgson's (Lewis Carroll) scrapbook of a letter to the editor of the Star newspaper contains a 'solution' to the problem of squaring the circle which, in the writer's words, " will not admit of the terms ordinarily used, 'approximated,' or 'nearly." The writer has found the square root of pi accurately to 26 decimal places,which is no minor feat. Dodgson seems, unlike many mathematicians then or now, to have spent a great amount of energy trying to explain to circle-squarers where they had erred. 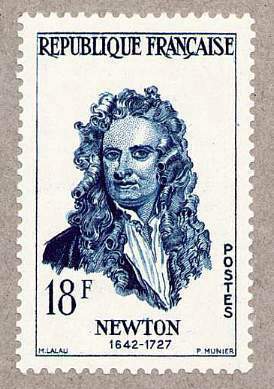 1957 France issued the world’s ﬁrst postage stamp with a portrait of Newton. [Scott #861]. *VFR By 1977 his picture had appeared on stamps from Poland, Benin, Hungary, Mali and Monaco. 1922 Imre Lakatos (November 9, 1922 – February 2, 1974) was a Hungarian philosopher of mathematics and science, known for his thesis of the fallibility of mathematics and its 'methodology of proofs and refutations' in its pre-axiomatic stages of development, and also for introducing the concept of the 'research programme' in his methodology of scientific research programmes. Lakatos' philosophy of mathematics was inspired by both Hegel's and Marx' dialectic, by Karl Popper's theory of knowledge, and by the work of mathematician George Polya. The 1976 book Proofs and Refutations is based on the first three chapters of his four chapter 1961 doctoral thesis Essays in the logic of mathematical discovery. But its first chapter is Lakatos’s own revision of its chapter 1 that was first published as Proofs and Refutations in four parts in 1963-4 in The British Journal for the Philosophy of Science. It is largely taken up by a fictional dialogue set in a mathematics class. The students are attempting to prove the formula for the Euler characteristic in algebraic topology, which is a theorem about the properties of polyhedra, namely that for all polyhedra the number of their (V)ertices minus the number of their (E)dges plus the number of their (F)aces is 2: (V – E + F = 2). The dialogue is meant to represent the actual series of attempted proofs which mathematicians historically offered for the conjecture, only to be repeatedly refuted by counterexamples. Often the students 'quote' famous mathematicians such as Cauchy. 1830 Jan Śniadecki (August 29, 1756– November 9, 1830) was a Polish mathematician, philosopher and astronomer at the turn of the 18th and 19th centuries. What's Wrong with This Clock?